Cut zucchinis and squash in half length-wise, then cut lengthwise again so they are quartered. Chop lengths into 1/4 inch pieces. Dice onion. Cook orzo according to package directions. Drain and pour into large bowl. Stir in butter, set aside. In a large skillet heat olive oil over medium-high heat. 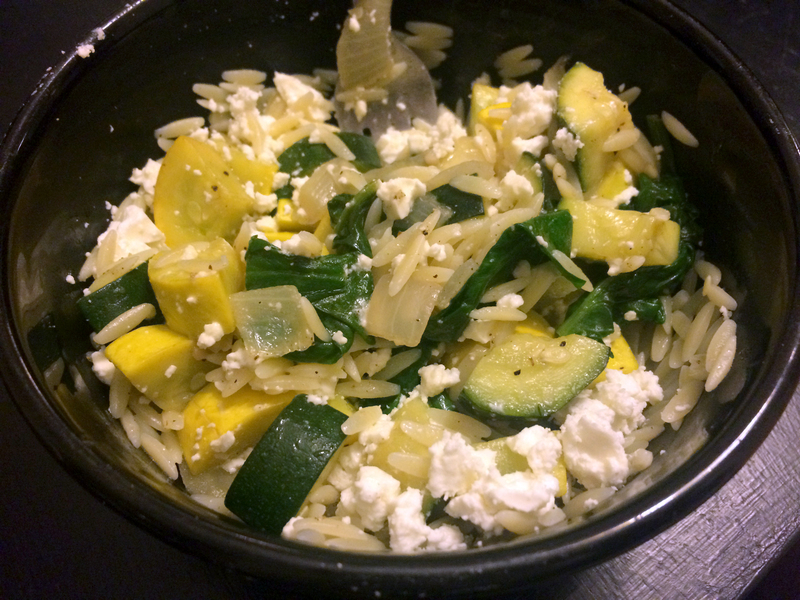 Toss in zucchini, squash and onion. Season with salt and pepper and sautée until soft and slightly golden. Turn off heat and stir in spinach. Cook just until wilted (30 seconds). Add veggies to pasta bowl. Season with salt and pepper to taste. Stir in crumbled feta and serve. Can be served warm or cold.